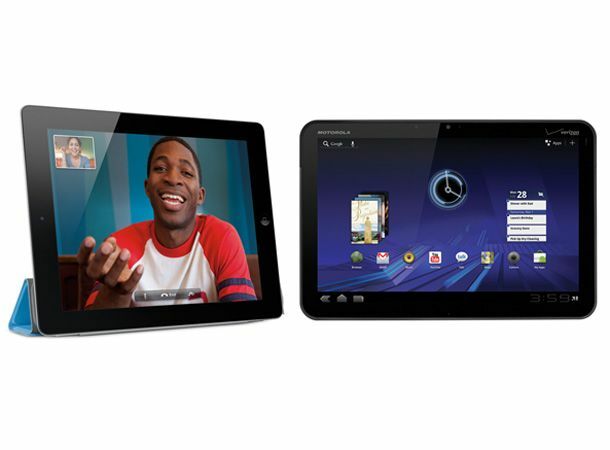 How does the Motorola Xoom stack up against the Apple iPad 2 in our spec comparison? Apple iPad 2: Weighing 601g the iPad is easy to hold with one hand, but still feels comfier when you use two. However its the depth that really impresses, measuring just 8.8mm deep, it's slimmer than an iPhone 4 and all-in-all is a stunning piece of design. Motorola Xoom: Weighing in at 730g, the Xoom is about 100g heavier than the iPad 2 and at 12.9mm looks positively chunky next to it. Build quality is excellent though, it feels sturdy and strong, although definitely needs two hands. It doesn't really stand out from the crowd though - just like the Samsung Galaxy Tab 10.1 and LG Optimus Pad. Motorola Xoom: Running Android 3.0 (Honeycomb), the OS that has been designed expecially for tablets. The UI interface is excellent, with five home screens you can customise for apps and widgets and a permanent navigation and notification bar at the bottom of the screen.Composing e-mails, checking your calendar, browsing the Web, using Google Maps, or simply playing with the settings are allsimple tasks, and it's a joy working with apps built and optimized for the larger screen. The tabbed browsing makes surfing the web a breeze, although there's support for Flash straight away. Apple iPad 2: As with its predecessor, the iPad comes in 16GB, 32GB and 64GB capacities, it launches with WiFi and WiFi+3G version. Elsewhere you got Bluetooth 2.1, aGPS. You can now connect to a flatscreen TV via HDMI using the Apple Digital AV Adaptor. Motorola Xoom: Available in one 32GB flavour, the Xoom has 3G and 3G if you live in the US, a WiFi version is rumored to be coming soon. Connectivity includes Bluetooth 2.1 and aGPS, along with built-in HDMI (not via an adaptor). Motorola Xoom: Powered by a NVIDIA Tegra 2 Dual Core Chip, with 1GB RAM, in practice it's exceptionally quick to use, loading web pages exceptionally quickly. Apple iPad 2: Capture 720p HD movies at 30fps using the main camera, there's a secondary VGA 30fps camera for FaceTime calling. Apple has not commented on megapixel rating for either. Motorola Xoom: The primary 5-megapixel camera shoots 720p movies at 30fps, the secondary camera is 2-megapixels, capturing VGA movies. Apple iPad 2: At 9.7-inches the screen is slightly smaller than the Zoom, it has a resolution of 1024x768, with full multitouch support. Shame we didn't get the Retina display we wanted. Motorola Xoom: The Xoom has a larger screen of 10.1-inches, with a higher resolution of 1280x800. Like the iPad 2 you get multitouch support. Apple iPad 2: Built-in apps include: FaceTime, the innovative Photo Booth, which lets you add crazy effects to pictures of yourself. Mail, Safari, Videos and Photos. Elsewhere the Apple App store has 65,000 apps. Motorola Xoom: On-board apps include: Google Maps, Gmail and Calendar are supplied. But because Honeycomb is brand new, App developers haven't had time to develop apps, so there are only 15 apps. You can use Android apps, but we had issues with crashing etc. Apple iPad 2: Apple quotes 10 hours of browsing, video and music listening. Web browsing drops to nine hours over 3G. Motorola Xoom: From our tests we got 10 hours of heaving web browsing over 3G, eight hours video. Turning off WiFi you can probably squeeze out between 10-14 hours of use. Apple iPad 2: In the US prices will be the same as the original iPad, so $499 (US) for the 16GB, $599 for 32GB and $699 for the 64GB model. Translate this to sterling and you're looking at around £429 for the entry-version and £499 for 32GB. Motorola Xoom: Expect to pay £499 for the 32GB version, which is comparable to the UK version. While the Apple iPad 2 and Motorola Xoom have similarites: processor, apps, camera they seem slightly different propositions. In our review of the Motorola Xoom, our writter likened the UI experience as being closer to that of a PC than that of a smartphone. Google clearly thinks so too, by having two different operating systems: Honeycomb and Gingerbread for tablets and mobiles. In contrast, regardless of how you use the tablet, the iPad 2 user experience is very similar to the iPhone 4 and iPod Touch.